Everybody needs a go-to classic Italian Cream Cake recipe from scratch! We have the perfect recipe for you….and it’s DELICIOUS! 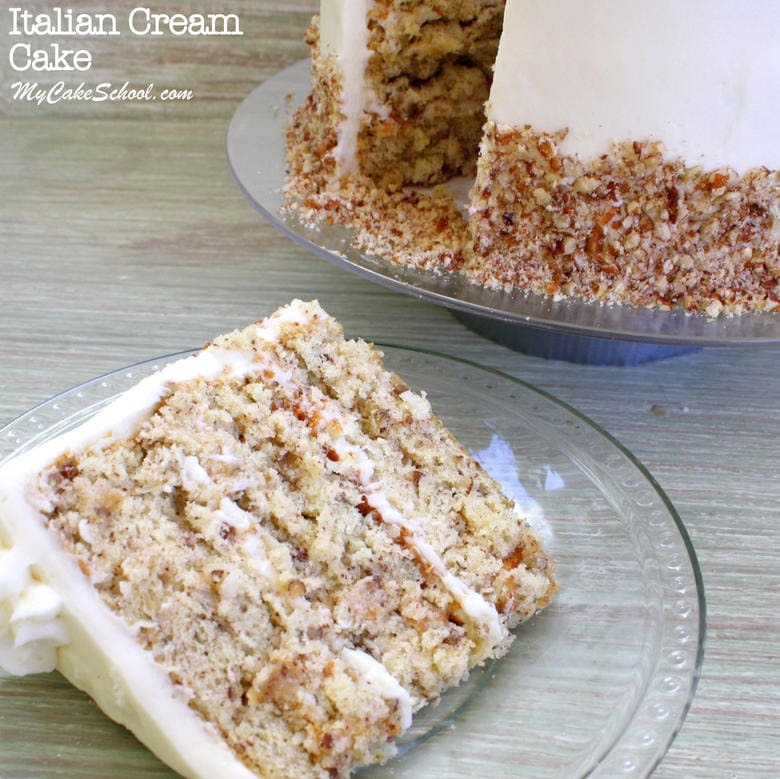 What is Italian Cream Cake- How did it get it’s name? Italian Cream Cake has long been one of my favorite desserts. This moist and decadent layer cake is packed with flavor from pecans and coconut (not to mention the heavenly cream cheese frosting)! This good old fashioned Italian Cream Cake is the real deal– a classic southern cake recipe that is a common sight at family gatherings, pot lucks, birthday parties, holidays and more! The funny thing is that nobody quite knows where the name Italian Cream Cake actually comes from. In my research, I found that it’s not a traditional recipe of Italy. Some say that the recipe first appeared years ago in a Texas newspaper….and others say that the “Italian” name comes from an Italian baker that prepared the dessert for a southern family in the US– and was so well received that the rest is history. All that I know is that whoever came up with this deliciousness is a genius! If you’ve never tried Italian Cream Cake, you absolutely must! 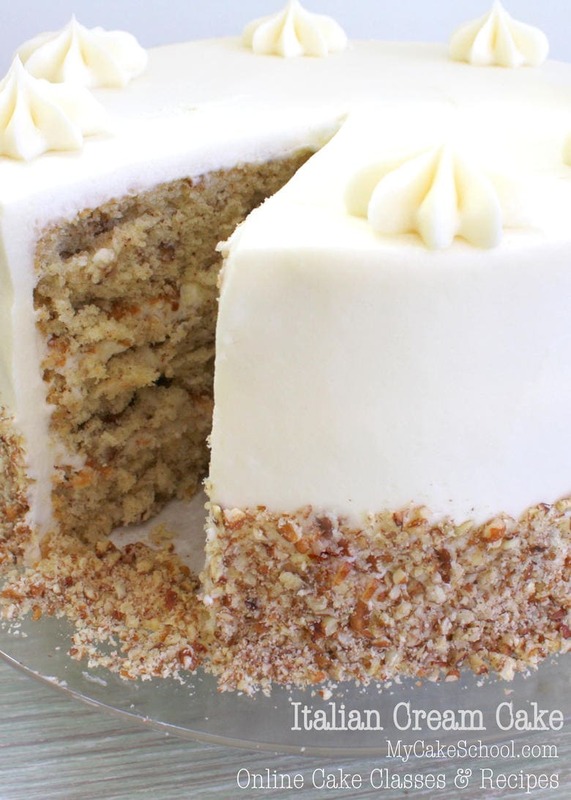 Italian cream cake is slightly more dense than the average cake (much like a carrot cake), and contains a heavenly combination of finely chopped pecans, coconut, and cream cheese frosting. With this trio of big flavors, how could you go wrong? Just look at that slice! I can hear it calling to me through the screen. If you’d like, you can stir your crushed pecans into your cream cheese frosting. We decided to go with a smooth finish with our frosting today and so we just pressed the finely chopped pecans around the sides, but you can’t go wrong either way. Beat butter at medium speed until smooth. Gradually add sugar, beating on medium speed 4 to 5 minutes. Add egg yolks, one at a time, beating after each addition until the yellow of the yolk has disappeared. Add Vanilla extract. Mix at low to medium speed after each addition until blended. Add pecans and coconut; using a spoon, stir well. Fold in stiffly beaten egg whites. Beat egg whites at high speed until stiff peaks form. Using a spatula or spoon, gently fold into batter. Spoon batter into three 8 or 9″ round cake pans. Bake at 350 degrees for 20 to 25 minutes or until inserted toothpick comes out clean. Cool for ten minutes before flipping out. Frost the cake with the cream cheese frosting (recipe below) and press crushed pecans around the bottom. SO good! No matter what kind of cake I’m making, I like to freeze my cake layers to make them extra moist. A baker told me this secret when I was just getting started with my home-based cake business about fifteen years ago and I’ve done it ever since. After removing my cake layers from the oven, I allow them to cool (still in their pans) on the cooling rack for about ten minutes. Then, I flip them out and while still warm, double wrap the individual layers tightly with plastic wrap, then with foil, and into the freezer they go! Freeze for at least three hours, but when baking in advance, you can safely freeze for up to three months with no problems! Your cake layers will be ultra moist and taste as fresh as the day they were made. When thawing, I remove from the freezer, and keep the layers wrapped until condensation has formed on the foil. That’s all there is to it! Chocolate Italian Cream Cake- A delicious Twist on a Classic! Did you know that we also have a FANTASTIC Chocolate Italian Cream Cake Recipe? It has the same wonderful flavor as this classic Italian Cream Cake Recipe, but with the addition of cocoa for moist and chocolatey cake layers. The combination of chocolate, coconut, and pecans is PERFECT! Not to mention, it has a Chocolate Cream Cheese Frosting that is just heavenly. We hope that you enjoy this moist and flavorful Italian Cream Cake recipe- it is ALWAYS a crowd pleaser! A Few More Favorite Southern Cake Recipes to Try! Italian Cream Cake is just one of those good old fashioned cake recipes that everyone needs in their recipe box. We have several other favorite southern desserts that you need in our life. Keep these in mind for your next birthday cake or just because! Make sure to check out our other favorite classic homemade cake and frosting recipes in our Recipes section! 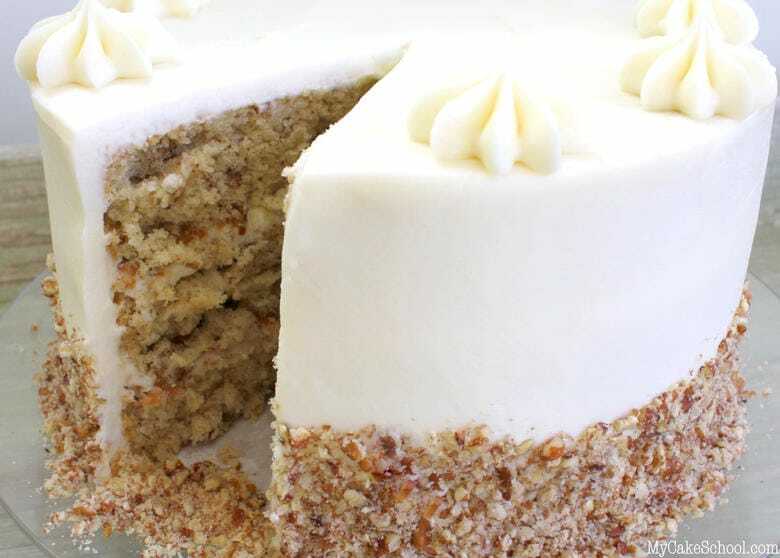 This amazing Italian Cream Cake recipe has so much flavor from chopped pecans, coconut, cream cheese frosting and more! 2( 8oz.) packages cream cheese (total weight 452g)- Softened slightly, I used full fat cream cheese. Using reduced fat or the spreadable cream cheese will cause the frosting to be too soft. If using a hand mixer you may need to soften slightly. If using a kitchen aid or strong mixer, do not soften the cream cheese, just cut into pieces when adding to bow. Beat butter at medium speed until softened and smooth. Gradually add sugar, beating on medium speed 4 to 5 minutes. Add egg yolks, one at a time, beating after each addition until the yellow of the yolk has disappeared. Add Vanilla extract. In a separate bowl, add flour, baking soda, and salt, whisk at least 30 seconds to blend. Add the flour mixture to the butter mixture alternately with buttermilk, beginning and ending with flour mixture (that is 3 additions of dry ingredients and 2 additions of buttermilk) Mix at low to medium speed after each addition until blended. Add pecans and coconut; using a spoon, stir well. Fold in stiffly beaten egg whites. Beat egg whites at high speed until stiff peaks form. Using a spatula or spoon, gently fold into batter. Spoon batter into three 8 or 9″ round cake pans. Bake at 350 degrees for 20 to 25 minutes or until inserted toothpick comes out clean. Cool in pans for 10 minutes, then remove and cool on wire racks. Cut the cream cheese into pieces and add to the butter, beating at low to medium speed until incorporated. Add the vanilla. Gradually add the powdered sugar beating on low speed until blended. Increase mixing speed and beat until fluffy, approximately 1 minute, don't over beat. If beaten too long it will become very soft. If this happens, just refrigerate for 10 to 15 minutes. This frosting will pipe best if used while still very cool. You can make it in advance, refrigerate and when ready to use let it soften slightly (do not microwave) and remix. For the filling, we spread the frosting between the layers then pressed in some of the chopped pecans. After the cake was completely frosted, we pressed the remaining chopped pecans around the bottom half of the cake. The traditional way to frost this cake is to stir all the pecans into the cream cheese frosting then frost the cake. If you are interested in learning more about cake decorating, don’t miss our Free Tutorials Section! Or, if you would like full online access to every cake decorating tutorial that we’ve made, you should consider becoming a member of My Cake School! I love this recipe! How much time would you recommend adding or would you change the cook temp for a 12” cake? Hi Blythe, It does have 1 teaspoon vanilla listed just under the buttermilk. It does not have baking powder because it has 1 teaspoon baking soda. I hope all goes well with your cake. I don’t see anything about greasing and flouring the cake pans. Since I’m in mid-cake, I’m going to do this. Hoping for the best. How do I get the cream cheese frosting to look this smooth?! How far in advance can I make Italian cream cheese cake? Hi Sylvia, you can bake and freeze cake layers weeks, even months before you need it. However, as far as the finished frosted cake, our general rule of thumb is that it will be eaten by the 3rd day after making it. Also, this recipe should be refrigerated. Is this cake sturdy enough for a wedding cake? Hi Lisa, Yes, it can be used for a tiered cake. Thanks for sharing this recipe! I’m excited to try it. Wondering how you feel about using mascarpone instead of cream cheese for the frosting? Hi Vanessa, We have not used mascarpone with this recipe but I think it would be fine to do so. Hello Melissa. I was wondering if I could substitute buttermilk with coconut milk and use coconut flavor. My customer does not want the coconut flakes but would like the coconut flavor. Hi Rena, We have not tried using coconut milk instead of buttermilk so I cannot be certain of the outcome. One cup of coconut is a lot to leave out of the recipe, I remember one comment saying they did that and it was ok but I can’t recommend it. A comment made on 10-2-1016 used frozen coconut instead of shredded coconut and said it melted into the cake and would be a good substitution for people who did not like the texture of coconut. Could that be a possible solution for you? I was wondering if we could use Mascapone creme cheese instead of regular cream cheese for the icing to give it a little extra special something for that name Italian Cream Cake even though it’s a southern recipe, this is an Italian cream cheese and has a nice supple taste, would it hold up like the regular creme cheese? Hi Christine, You can use Mascarpone cream cheese if you like. I use it so rarely that I can’t give a confident comparison of the two. It does hold its shape and has more fat than regular cream cheese. You could use half mascarpone and half cream cheese. Very excited to try this recipe! Groom wants an Italian cream cake but bride wants a smooth finish and this gives the best of both. I was worried that the flavor wouldn’t be as good since all the additions to the icing would be left out for a smooth finish but your recipe seems to have more added to the actual batter so the flavor remains. Thank you for sharing. I hope you will enjoy the cake, let us know.